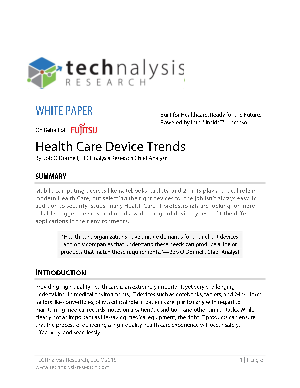 "Health Care organizations have unique demands for their client devices and only companies that understand these needs can produce a line of products that match those requirements." Mobile computing devices like notebooks, tablets, and 2-in-ls play a critical role in modern Health Care, but selecting the right devices for the job isn't always easy. In addition to security issues, many Health Care IT professionals are looking for more reliable, rugged devices, and need a wider range of device types to fit the different applications in their environments. Simply put, the right IT products can ensure that the process of delivering a high-quality health care experience will occur safely, effectively, and seamlessly.